The Yale Veterans Association’s Heroes Day at the Yale Bowl was, once again, a huge success. Driscoll Cares was proud to play a role in recognizing our blind and sight impaired veterans who served our country. Driscoll Cares would like to thank everyone who participated. There may be champions on the playing field on Saturday October 28, 2017 when the Yale Bulldogs meet the Columbia Lions in the Yale Bowl, but there will be heroes in the stands. During “Heroes Day at the Yale Bowl” the Yale Veterans Association – as part of a partnership with the West Haven VA – will bring a group of blind veterans to the football game, where they will be seated in a reserved section along with their volunteer escorts. Blind United States Powerlifting Champion Charles King will be honored and escorted into the Yale Bowl by Driscoll Cares. (Please visit “Charles King Funding” and “Eastern Blind Rehabilitation” under the Driscoll Cares Projects Tab). Fans are encouraged to stop by the Yale Veterans Association tent in the Hospitality Village, where there will be an obstacle course as well as military and civil service vehicles to explore. 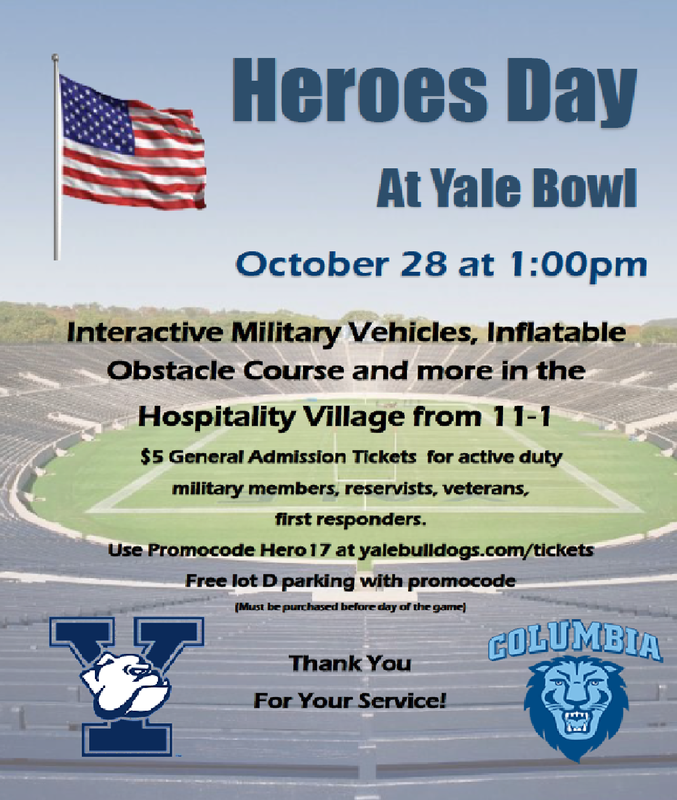 The Veterans Hospitality Tent opens at 11am and Yale vs Columbia kickoff time is 12:30. Fans are asked to bring an unwrapped toy to support the U.S. Marines Corps’ Toys for Tots drive.